You can follow our adventures at our On the Road of Retirement blog and you can reach us via email. Retirement can mean a lot of things to a lot of people. To my wife and I retirement meant leaving our sticks and bricks house behind to hit the road. When we first began contemplating retirement we considered several options. We could stay where we were living in Texas or we could buy a retirement home in some other location such as Florida since property was so affordable then. Lastly we could sell everything we own, purchase a nice motorhome with a tow vehicle and set off to explore the USA in search of our future retirement hot spot! That idea, we decided would also afford us the opportunity to see every game of our daughter’s senior season of collegiate softball (priceless). It would also offer us the ease and flexibility of visiting our daughter out east and our son, daughter-in-law and grand-kids back in Texas whenever we wanted. About one year before we retired we began the task of ridding ourselves of all of our possessions or “STUFF” that obviously wasn’t going to fit into our RV. Once our stuff was purged all that was left were the necessities to complete our new home, our 400 square foot Class A Motorhome. Now that was downsizing! We decided against putting anything in storage, so after our “stuff” was given away or sold, we put our house on the market to sell. We had never RV’ed in our entire lives but now we were selling everything and hitting the road like a couple of gypsies. They say ignorance is bliss and it must be true as we happily took off knowing we were about to learn a lot about RVing in a learn-as-we-go fashion! As we quickly found out, there is a whole community of us out there and with the world wide web we have appreciatively received tips, support and advice from many seasoned full-timer RV’ers. In looking back, as newbies to the RV world there was a steep learning curve but we managed to travel from Texas to the Florida Keys in about four months without destroying the RV or our marriage. Our itinerary that first year had us traveling our daughter’s softball venues in the southeastern states and after her graduation, from the Florida Keys to Maine and back down to Texas. The second year we traveled along the west coast into California, Oregon and Washington. This past year, our third on the road, we went north to Niagara Falls and visited Canada before traveling around all the Great Lakes. This year the plan is to experience Mardi Gras in Louisiana, spend a month in Texas then explore the Mountain States perhaps wintering in either San Diego or in Arizona. We will have been on the road for three years in March 2014 and we have absolutely no regrets about choosing this retirement lifestyle. We have found our expenses equal what they were when we were living in a house but we have seen so many wonderful sights, made many amazing new friends and had numerous lifelong adventures. There are still several items on our bucket list to cross off so we aren’t stopping our road trip anytime soon. For those of you who are considering this lifestyle we highly recommend you stop procrastinating and get rid of your stuff now! We feel you will happily realize as we did that trading “stuff” for experiences is fascinating, invigorating and exciting. The road with its many superb adventures is awaiting you! Hello! 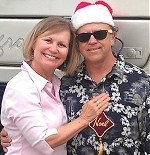 We really want to join the rv retirement community, but worry about selling home, as we would need to. We would love to hear your thoughts about not having a permanent home. What’s the plan once you are done traveling?